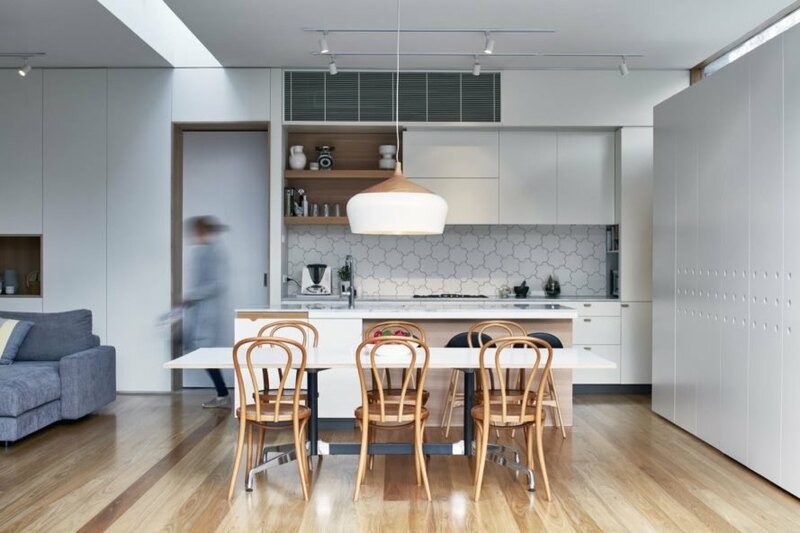 When Camberwell-based design practice Warc Studio Architects was tapped to renovate and extend an existing Edwardian residence in Victoria, the Australian firm also wanted to open the house to greater connection with the outdoors. 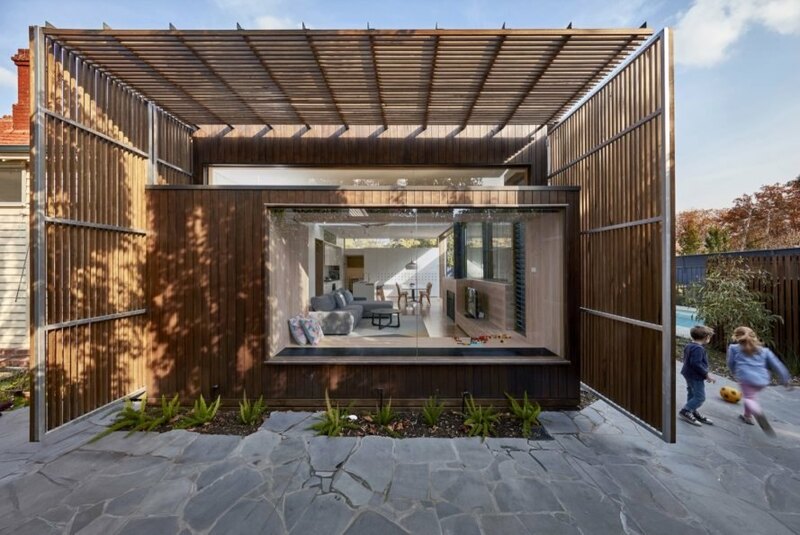 To mitigate the site’s potentially harsh western aspect and hot summers, the architects strategically constructed an externally operable screen that inspired the project’s name, the Screen House. Passive solar principles were also applied to keep the home comfortable year-round as were other sustainably minded design decisions, such as low-VOC finishes, formaldehyde-free plywood and the inclusion of a compost and vegetable garden. 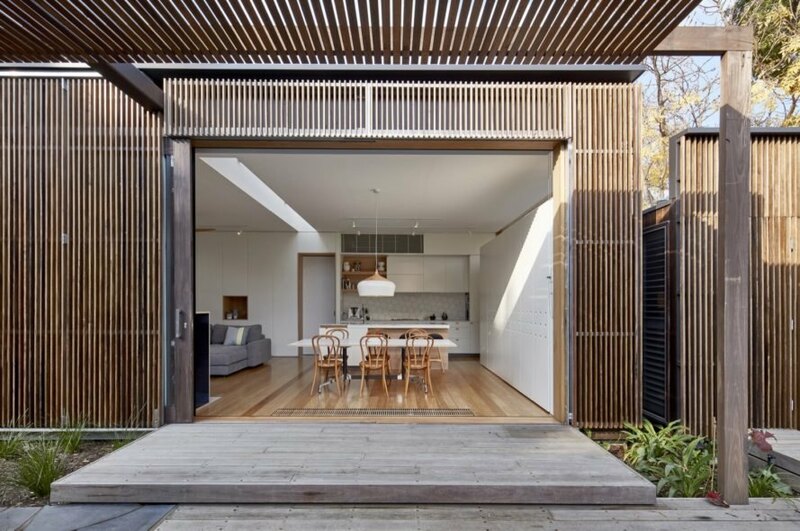 Completed in 2016, the Screen House began with the renovation of an existing detached weatherboard Edwardian residence. The architects upgraded the bathrooms and private areas while simultaneously improving internal circulation and making room for greater landscaping and a new swimming pool. To make the most of the newly added gardens and swimming pool, the firm designed an addition to house a new open-plan living room, kitchen and dining area overlooking the landscape. The main corridor that connects the extension to the existing house provides immediate views to the rear garden from the front entrance. Timber hardwood screens envelop the rear additions to mitigate unwanted solar gain without compromising views and can be manipulated to maximize seasonal variation in passive solar radiation. To minimize energy needs and waste, the Screen House has also been equipped with high-performance insulation, double glazing, rainwater harvesting and hydronic heating underfoot. This home employs passive solar principles and other sustainable design elements for a breezy, cozy environment. 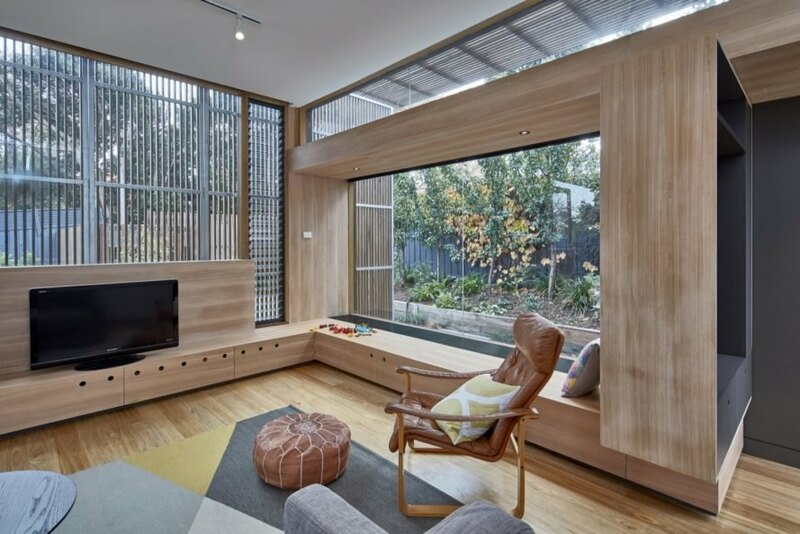 Large operable screens keep the house at a comfortable temperature. 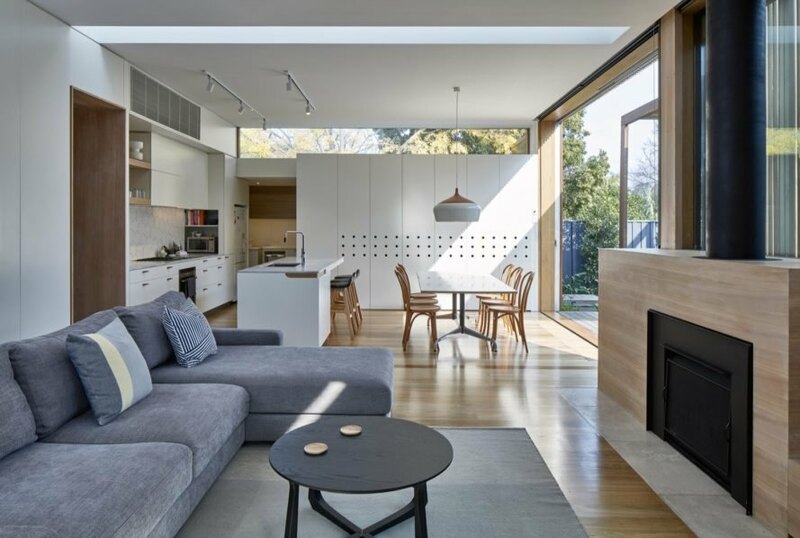 A large sliding glass door connects the open-plan living space to the outdoors. Large windows allow the family to enjoy views of the outdoors. The living area is arranged in an open-plan layout. The home features low-VOC and non-toxic materials. A bright white kitchen is open and airy. The dining space is ideal for family dinners or entertaining. The home is energy efficient thanks to high-performance insulation and double glazing. 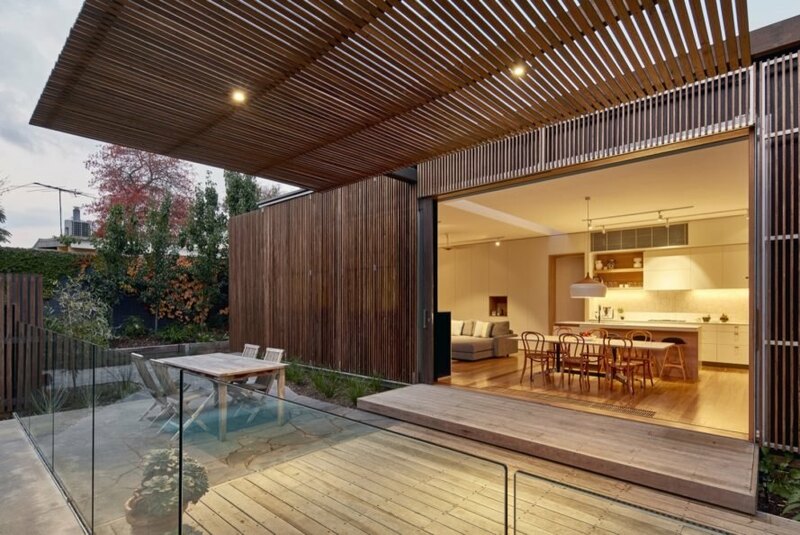 The Screen House also features rainwater harvesting and space for vegetable gardens and composting.